If you always want to be in fashion and even your mobile phone's ringtone changes each week, MP3 To Ringtone will allow you to easily have the latest hits on your phone. You only have to drag and drop any song to be able to crop the chorus or the tune that you want and send it to the mobile. 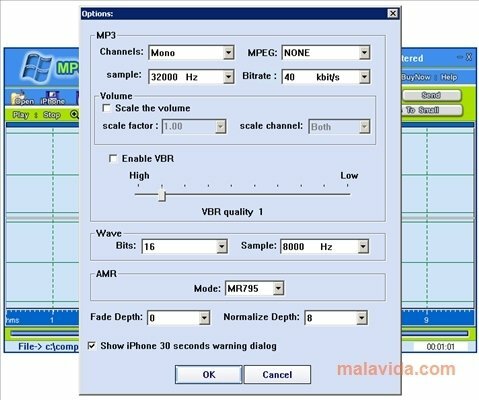 MP3 To Ringtone is a software that converts any MP3 file to the most used format on mobile phones (MMF, WMA, AMR, WAV, QCP and OGG) with the main objective to be able to obtain a song that occupies a lot less space. Furthermore, that software includes a series of presets that improve the sound quality through any mobile phone's small speakers. On the other hand, it's possible to normalize the sound, as well as edit the clippings to make the volume increase or decrease during the ringtone, depending on your own preferences. 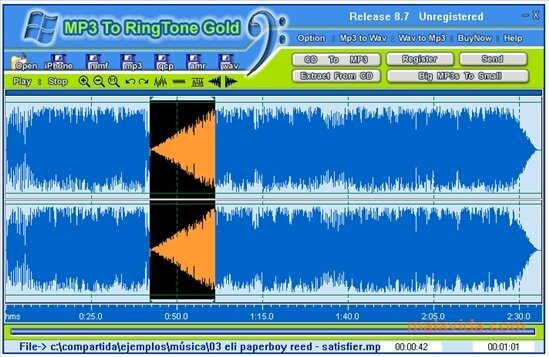 We also have to remember that MP3 To Ringtone can convert any CD to MP3 to be able to easily edit it, as well as being able to send to a telephone any polyphonic ringtone that we have just created. The trial version only allows you to create 5-second ringtones.